This page is similar to the old website. The top of the page has an area for banner ads, links to interesting events and news articles for interested people. If there is/are surveys available to be taken, links to the surveys will appear above the banner ads. The short description of Scottish Country Dancing has been the same for years. The picture on the right is selected randomly from a group of pictures stored on the website. There is a strip of thumbnail images near the bottom of the page. Click on any of these images to see it full size. 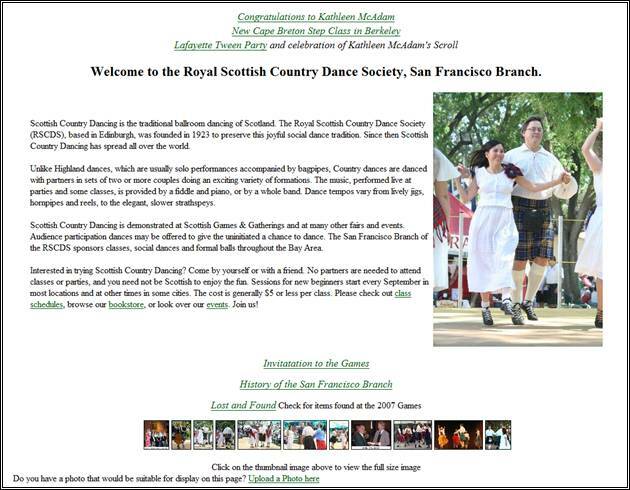 Static links are above the thumbnails and include the Invitation to the Games and the History of the San Francisco Branch links from the old website as well as a link to the Lost and Found. In the old website, the lost and found area was included in the Branch Resources, but it was determined that this area is of public interest, so it was put on its own page. If you are logged in, at the very bottom of the page is a link that will allow you to upload a photo to be included in the library of photos for the Home Page. style='mso-spacerun:yes'> Clicking this link will open a window as follows. Click on the Browse button to open a File Open Window, locate the image you want to use, highlight the image (click on it) and click the open button. You will be brought back to this window. Click the Upload File button. A confirmation will be displayed. This does not load the photo in the library. It will be loaded into a quarantine area. If the image is appropriate to use, it will then be placed in the photo library. It can be deemed inappropriate if the image is too small (minimum size is 200 pixels by 300 pixels), includes recognizable images or youth dancers, or is deemed to be of inappropriate content. Photos of youths can be included if the WEB Master receives a hardcopy model release signed by the Parent or Guardian of the youth. Contact the WEB Master through the link in the page footer for a blank model release. I would like to create a video library in the future and would like to receive video clips. Copyright issues will require that I receive permission to post from the musicians playing in the clip. If the video is of a demo performance where the routine is copyrighted, I will also need a permission to post from the demo group. I will assume that a demo performance by an organized demo group is copyrighted.